A day on a Bluewater Trip can be very different depending on which destination you are in. Regardless, in all of our destinations our itineraries remain flexible. 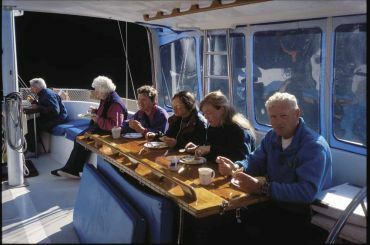 This allows the crew to take time to enjoy wildlife sightings, spend more time at an ancient village site, or simply cater to the interests of the group. Each night the skipper will go over what he plans for the day ahead. It is usually a general idea - But you can bet they always have the best in store for you! In the morning, you might expect to have breakfast served around 8am. If you are an early riser there is always the opportunity for a morning kayak around the secluded bay we are anchored in. After the meal, a shore excursion will take place - Either to search for wildlife, look at intertidal zones, or go for a culture/nature hike. We will load into the zodiacs and take off to see what nature has in store for us. Bring your backpack, water bottle & camera! You never know what you'll see on these outings. After lunch, we might spend some time relaxing, while the crew puts up the sails and takes you through a passage or strait. This would be a good time to reflect in a journal or take a book from our extensive reading library. 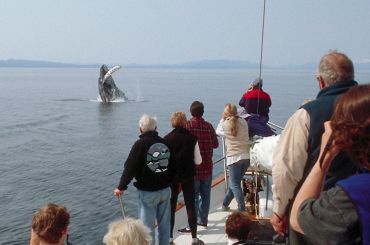 If we are lucky, you may see some Humpbacks frolicking in the waters around the boat. If this happens we turn off the engines and float silently among them - quite spectacular. Before dinner we might do a light hike to bear stands to view some grizzly or black bears feeding on the salmon, or enjoy an afternoon kayak. 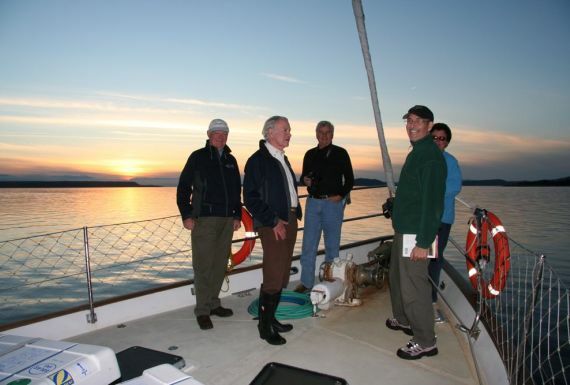 We serve dinner and then might go for a dip in some remote hotsprings along the coast, and then come back to the boat and enjoy some British Columbia wine. Each night we have a Bluewater custom. The Chart Talk - The skipper will bring out a large map of the area and go over all the places we travelled that day. At the end of the trip this is a great map, which guests usually copy onto their own maps, or write down all the places in their journal. 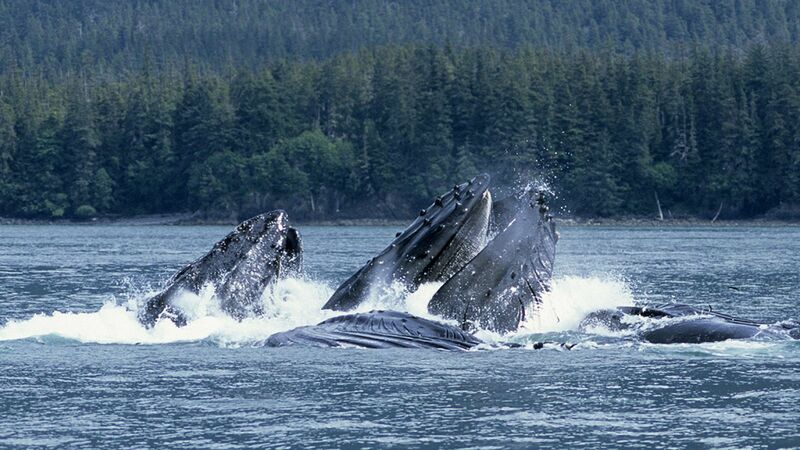 It's at this time, the Naturalist on the trip will also discuss all the species the group saw that day. At the end of the trip we've a VERY large species list. 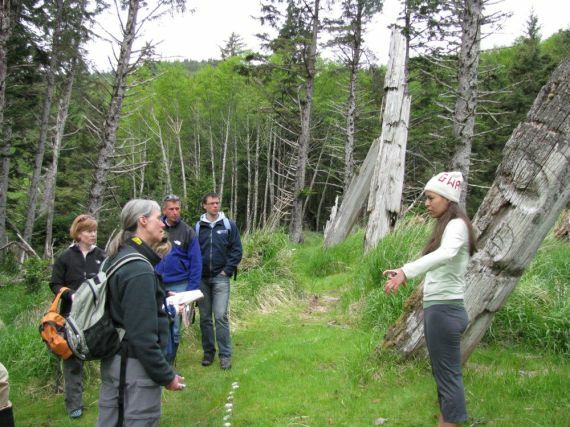 It's also a good time to talk about anything the group wants to learn about - For example, the ancient Haida Culture in the Queen Charlotte Islands or the history of the lands in the Great Bear Rainforest. There is much to learn, and our crew is very knowledgeable. After this, you are free to stay up and read, play some card games, or retire for the evening.